Once upon a time, some say, during the period of the French Invasions, the French soldiers used to eat sandwiches of mixed meats and a lot of cheese. One main ingredient was missing: the sauce folks of Porto poured over the sandwich. But in fact it most probably is only 60 years old, when an ex-emigrant, Daniel David Silva, then working in the Restaurante a Regaleira, created the francesinha based on the French speciality croque-monsieur. 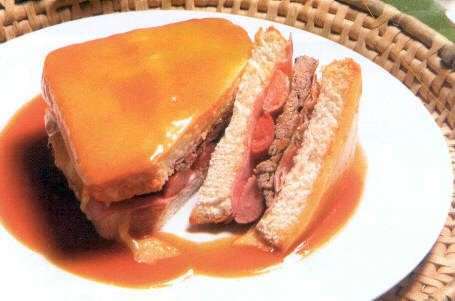 Where can you eat a francesinha? Café Pontual, Rua do Almada Its a regular cafe in Porto, but the owners came from the late Café Luso, where you could eat probably the best francesinha in town. Convívio, R. Arquitecto Marques Silva 303, Porto Another famous place to go late hours! But there are of course, many more places where you can eat it.